The Alpine stone pine is referred to as the “Queen” of trees beyond the timberline, and very often the only species that can survive at such altitudes. 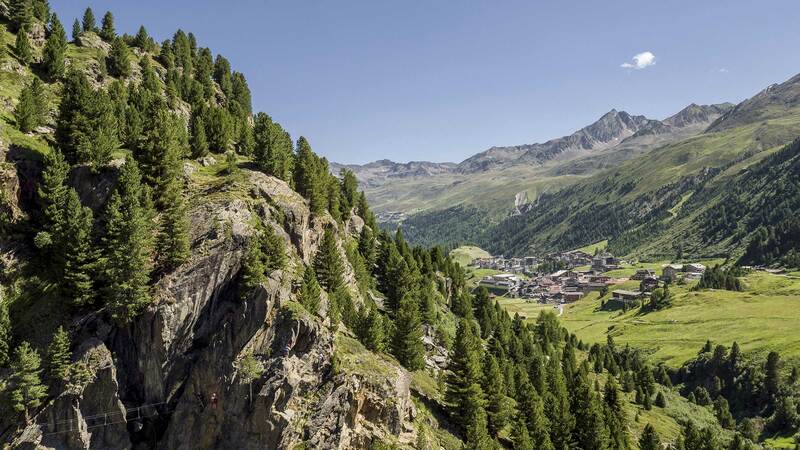 Therefore the isolated Stone Pine Forest of Obergurgl is a true rarity. Nestling amidst the “Gurgler Kamm” UNESCO Biosphere Park, it was declared a Nature Preserve already in 1963. This summer the colorful wooden info boards of the 12 Theme Trail stations were replaced by 15 new installations. Reason enough to pay a visit to her Majesty under deep green coniferous trees. Without question, stone pines are quite appealing figures in high Alpine mountain forests, braving storm and inclement weather in fairly exposed locations. Bizarre tree roots and trunks deformed but not destroyed by strokes of lightning. 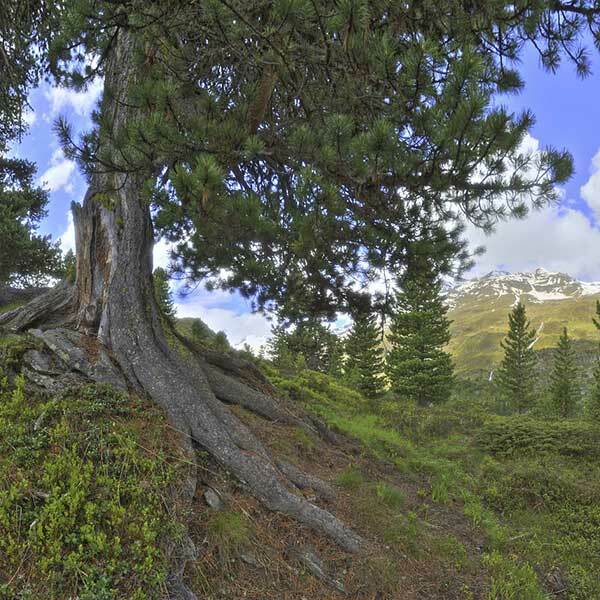 Although a huge forest fire happened in Obergurgl’s Stone Pine Forest in 1880, the biggest trees are about 400 years old. On my walking tour I stop for a moment and imagine the ancient stories a stone pine tree could tell me. Young trees have tap roots for soaking up water. In the course of the years the tree also develops lateral roots towards the rocky surface. And finally “pinus cembra” tentacles bigger than my upper thigh cling firmly to the blocky soil, withstanding also heavy storm gusts. Usually stone pines can be found alone or together with small groups of Alpine larch trees. Entire stone pine mountain forests can be counted on the fingers of one hand. That is why Obergurgl’s Stone Pine Forest is so precious and unique. 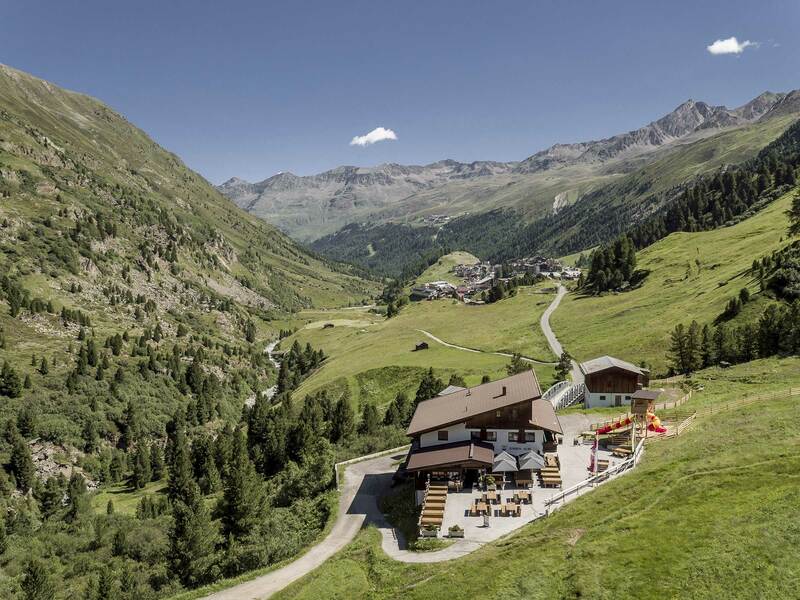 Ideal stopover for visitors and forest fans: “Zirben Alm” near Obergurgl. The whole Stone Pine Forest covers about 20 hectares, stretching from village’s south at 1950 m towards the northern mountain flanks of Schönwieskopf at 2100 m altitude. Among the most popular Alpine forest animals ranks the Eurasian nutcracker, a brown spotted mountain bird that loves stone pine seeds and collects them in different hiding places. As the birds forget some of these depots, the stone pine seeds ensure the continuing survival of these special trees. Additionally, hundreds of thousands of mountain ants create huge anthills in the environs – they are under environmental protection. 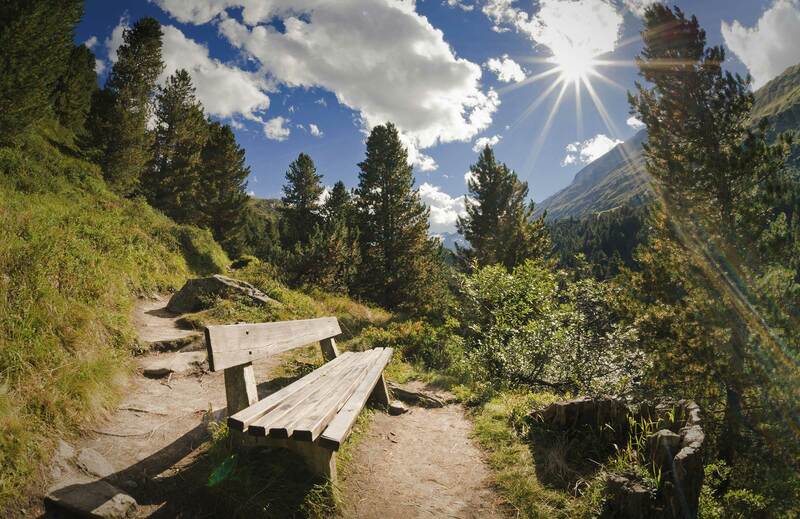 The new Theme Trail adventure starts at half height of the Stone Pine Forest, just a few steps away from the middle station of Hohe Mut Mountain Gondola – so don’t forget your Ötztal Card! A visit to Hohe Mut Alm mountain inn is an absolute must, offering awesome views of the Alpine scenery plus mouth-watering culinary delights. A true hot spot in Ötztal. At first you should indulge in the new Stone Pine Adventure Trail. The wooden information boards were replaced by brand-new installations like a telescope showing male, female and baby marmots. On my first visit to the Stone Pine Forest I simply missed them! 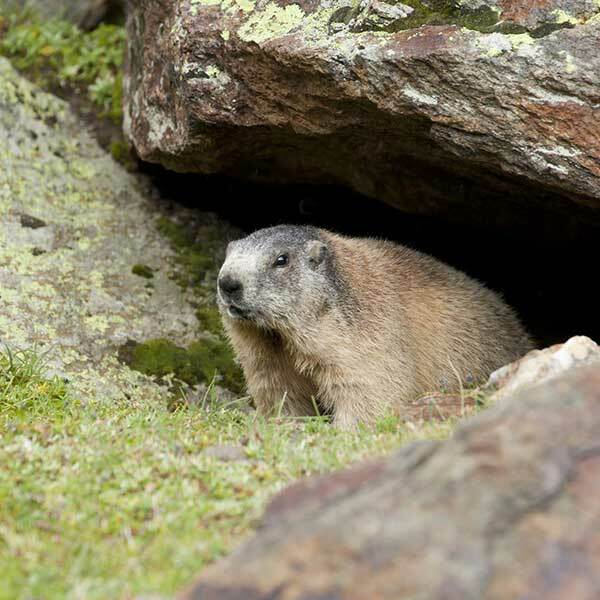 But this time I can zoom the marmots in and take a very close look at them. The new Stone Pine Forest Trail is skirted by relaxation areas and lovely benches, playful activity stations for all senses and interactive installations for young explorers amid the stone pine forest. The trail has been extended and improved by changing also its themed course. The 12 former info boards were replaced by 15 new panels giving an insight into all details of stone pine wood, resin, seeds and cones. Stone pine wood, for example: carpenters appreciate its lively grain and hardness – the ideal raw material for hand crafted bed frames or wood paneled walls. The scent is truly unique! 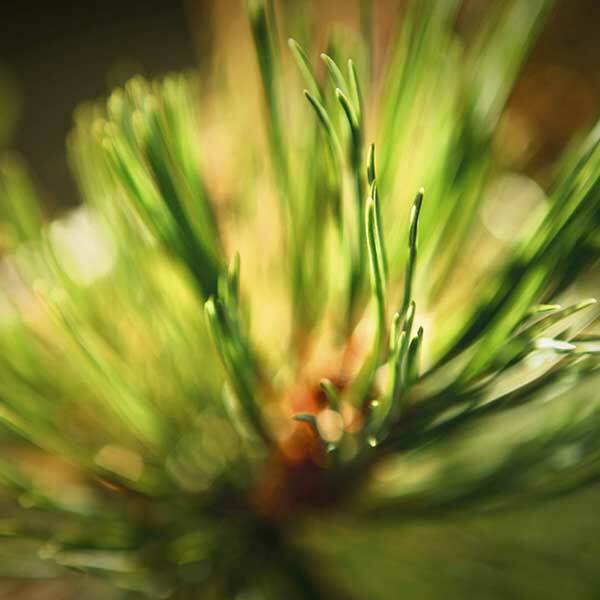 There is no other coniferous tree with such a concentration of nice-smelling pinosylvin. The scent of stone pines also repels flies, it has bactericidal and fungistatic effects, and decreases your heart rate. Therefore it became an important ingredient of the cosmetics industry – ranging from bath essences to aroma lamp oils. Stone pine seeds can be used for baking. While the young, green cones are collected and prepared with alcohol. By the way, it is strictly forbidden and fairly dangerous to collect stone pine cones. A mouth-watering “Zirm Schnaps” is strongly recommended after a sumptuous meal. Each stone pine expert has its own secret stone pine schnaps recipe. All those who follow the slogan “the more the merrier” … probably can experience a very special kind of Alpine elation, followed by a revitalizing extra walk through the splendid Stone Pine Forest of Obergurgl. Getting here: Leave our car at Obergurgl’s “Schalfkogelweg” parking area or take the public bus lines 4194, 8405 or 8352 to the village center of Obergurgl. Then follow “Ramolweg” to the base station of Hohe Mut Mountain Gondola. The short variant starts at the middle station (2065 m above sea level). Walking distance: 4.4 km / Difference in altitude: 150 m / Walking time: 2 h. Recommended refreshment stop at Zirben Alm. The family-friendly Stone Pine Trail is walkable until the start of winter. 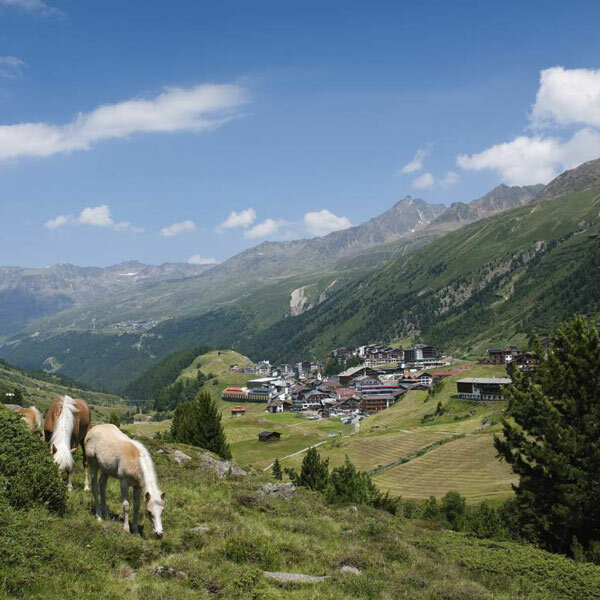 The new brochure in German (“Von Blicken und Perspektiven – Zirbenweg Obergurgl”) is available for free at the Ötztal Tourismus Information Offices. Lutz Bormann (born in 1956) started hiking at the age of ten. 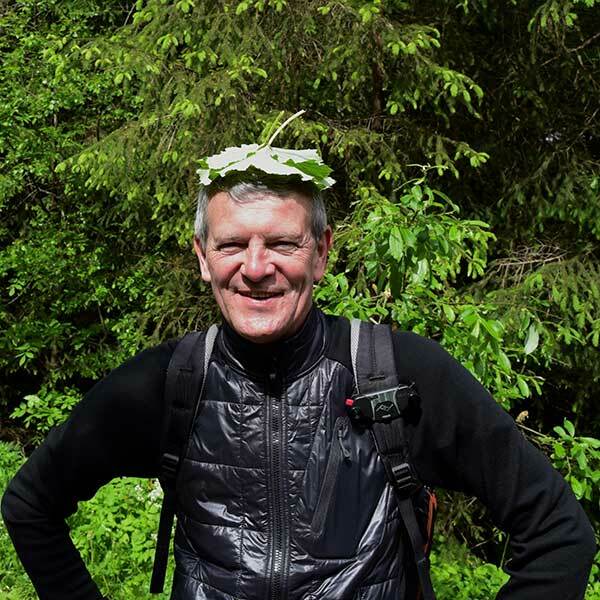 Since 1991, he has combined his greatest passion with his profession of journalist: he wrote for the BERGE Magazine, then for DAV Panorama (German Alpine Club) and varied other outdoor magazine as he also runs his own editorial office. ... varied guest authors write about their adventures and experiences in the Ötztal / in Sölden / in Obergurgl-Hochgurgl.